Ever since J.J. Thompson’s 1897 discovery of the electron, scientists have attempted to describe the subatomic particle’s motion using a variety of different means. Electrons are far too small and fast to be seen, even with the help of a light microscope. This has made measuring an electron’s movement very difficult for the past century. 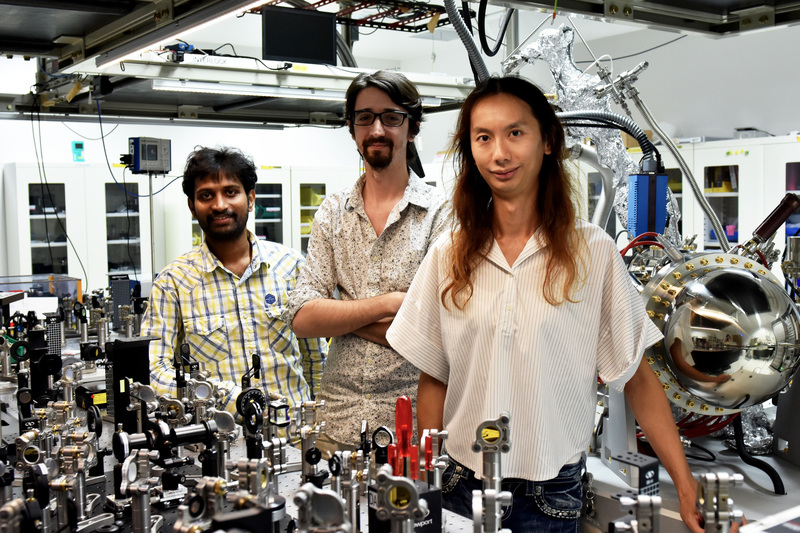 However, new research from the Femtosecond Spectroscopy Unit at the Okinawa Institute of Science and Technology Graduate University (OIST), published in Nature Nanotechnology, has made this process much easier. “I wanted to see the electrons in the material. I wanted to see the electrons move, not just to explain their motion by measuring a change of light transmission and reflection in the material,” said Prof Keshav Dani, leader of Unit. The limiting factor to studying electron movement using previous techniques was that the instrumentation could either provide excellent time resolution or spatial resolution, but not both. Dr. Michael Man, a postdoctoral fellow in Prof. Dani’s Unit, combined the techniques of UV light pulses and electron microscopy in order to see electrons moving inside a solar cell. If you shine light on a material, the light energy can be absorbed by the electrons and move them from a low-energy state to a higher one. If the light pulse that you shine at the material is very, very short, a few millionths of a billionth of a second – that is a few femto seconds – it creates a very rapid change in the material. However, this change does not last long, as the material goes back to its original state on a very fast time scale. For a device to work, like in a solar cell, we have to extract energy from the material while it is still at the high energy state. Scientists want to study how materials change state and lose energy. “In reality, you cannot watch these electrons changing state on such a fast time scale. So, what you do is measure the change of reflectivity of the material,” Dr. Man explained. To understand how the material changes when exposed to light, researchers expose the material to a very short, but intense, pulse of light which causes the change, and then continuing to measure the change introduced by the first pulse by probing the material with subsequent much weaker light pulses at different delay times after the first pulse. This schematic depicts the time-resolved photoemission electron microscopy instrumentation that allowed the Femtosecond Spectroscopy Unit to visualize electron movements. 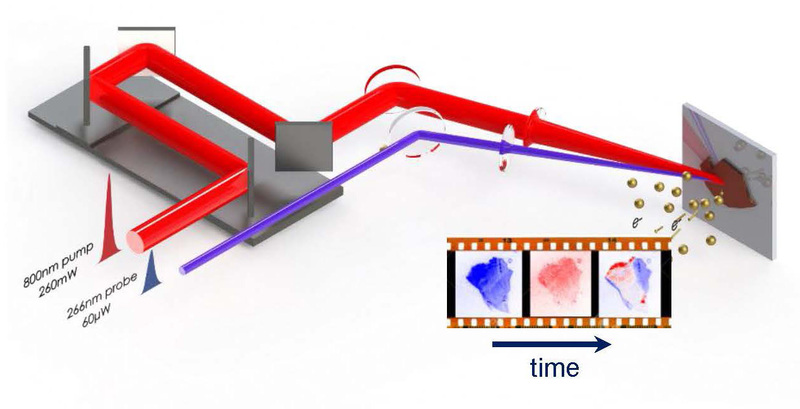 The 800nm pump pulse (red) excites electrons while the weaker 266nm probing pulse (blue) allows for different measurements of electron movements to be taken. Prof. Dani’s team found a way to visualize this phenomenon in a semiconductor device. “When the pulse hits the material, it takes some electrons out, and we use an electron microscope that forms an image of where the displaced electrons came from,” Dr. Man said. “If you do this many times, for many photons, you can slowly build up an image of the distribution of the electrons in the material. So you photo-excite the sample, you wait for a certain time, and then you probe your sample and you repeat this process again and again, keeping the delay between the first pulse of photons and the probing photons always the same.” As a final result, you get an image of the location of most of the electrons in the material at a specific time delay. “We have made a video of a very fundamental process: for the first time we are not imagining what is happening inside a solar cell, we are actually seeing it. We can now describe what we see in this time-lapse video, we no longer have to interpret data and imagine what might have happened inside a material. This is a new door to understanding the motion of electrons in semiconductors materials.” Prof Dani effused. This research provides a new insight into the movement of electrons that could potentially change the way solar cells and semiconductor devices are built. This new insight brings the technology field one step closer to building better and more efficient electronic devices.